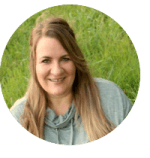 This gift guide does contain affiliate links. This superhero gift guide is full of fantastic ideas that fuel the inner POW inside all of us. With over 100 super hero gift ideas, I’m confident you’ll find something for the superhero fan in your life. There truly is something for everyone! From baby toys all the way to home decor and you can do all your shopping without even leaving the comfort of your home! How’s that for putting your super powers to work? Let’s get started, with the toys of course! Superman & Batman Teethers: It’s never too early to introduce baby to superheroes! Playskool Heroes Super Hero Adventures: The entire squad is in this set. From Iron Man to Captain America. DC Superheroes Matching Game: Can you match up the superheroes? Playskool Heroes Marvel Iron Man Armor Up Fortress: Perfect playset for the superhero figures listed above. Playskool Heroes Marvel Superhero Adventures Stark Tech Armor with Tony Stark Figure: The ultimate Iron Man toy. Superhero 3-In-1 Craft Kit: Design your own superhero cape, mask, and more. Play-Doh Smashdown Hulk: Build Iron Man out of clay and let Hulk smash! Funko Batman POP Heroes: This collectible figure makes for one adorable superhero. Don’t forget to check out the Funko POP Heroes Series. Marvel Spider-Man Web Dart Blaster: Sling webs just like Spider-Man! DC Collectibles Batman: The Animated Series Batwing Vehicle: Perfect for the superhero fan who has everything. DC Collectibles Batman: The Animated Series The Joker Action Figure: Every Batman needs a villain. Spider-Man by Sphero: This version of Spider-Man makes for one fantastic interactive friend. Marvel 2CH Spider-Man Marvel IR Helicopter: Take your favorite superhero for a r/c ride with this helicopter. Homecoming Spider-Man With Spider Racer: Spidey needs a vehicle to race around town. Marvel Spiderman Ultimate Pillowtime Pal: Snuggle up to Spidey for a great night’s sleep. Spiderman Walkie Talkies: Great for coordinating attacks on the villains. Spiderman Fidget Spinner: Every pocket should have a fidget spinner. XPV Marvel-RC Hulk Smash Toy Vehicle: This R/C car, smashes, flips, and even does wheelies! Marvel Avengers Titan Hero Tech Interactive Hulk Buster: This action figure interacts with Titan Hero Tech Avengers. Thor’s Rumbling Hammer: Thor’s replica hammer makes crushing sounds. Wonder Women Doll: This doll has it all. From the outfit to the lasso. Marvel Avengers Hulk Gamma Grip Fists: Put the power of the Hulk in your hands with these fists. Rock ‘Em Sock ‘Em Robots: Batman v. Superman Edition: A great classic game, with a superhero twist. Set of Superhero Foam Balls: This set comes with 12 foam balls, each with a superhero. LEGO offers a ton of different superhero sets. They’ve even started making superhero girls! LEGO DUPLO DC Comics Super Heroes Batman Batwing Adventure Set: Comes complete with Batman, and the Penguin, of course. LEGO DC Superhero GIRLS Eclipso Dark Palace: Every girl superhero needs a palace. LEGO DC Superhero Girls Batgirl Batjet Chase: Batgirl needs to stay up with Batman and his Batmobile! DC Superhero Girls – Batgirl Secret Bunker: After racing around in her Batjet, Batgirl needs a place to hunker down. LEGO DC Superhero Girls Super Hero High School: This superhero high school has three levels. LEGO DC Superhero Girls Bumblebee Helicopter: The new superhero, Bumblebee, has one fantastic helicopter. LEGO DC Superhero Girls Wonder Woman Dorm: Wonder Women has everything she needs, including a workstation to repair her invisible bike. LEGO DC Superhero GIRLS Harley Quinn Dorm: There are a ton of accessories in this set. And did you know Harley Quinn’s bed is shaped like a trampoline? LEGO Batman The Ultimate Batmobile: This LEGO set is a must-have for all superhero fans. LEGO BrickHeadz Batman Building Kit: Build Batman with the best building bricks of all time. This guy even has glow in the dark eyes! LEGO Arkham Asylum: The villains need a place to go, build their very own asylum. LEGO Marvel Superheroes Spider-Man Web Warriors Ultimate Bridge: This bridge has it all. From a trap door to a prison cell. LEGO Juniors Spider-Man Hideout: Love the minifigures in this set! Take a look. LEGO Super Heroes Kryptonite Interception: Batman vs Superman…. who will win? LEGO Marvel Super Heroes Iron Man: Detroit Steel is featured in this building set. LEGO Batman Movie Mr. Freeze: Mr. Freeze is one of my favorite Villains! LEGO Batman Movie The Joker Notorious Lowrider: There couldn’t be a better car for a villain. LEGO Batman Movie The Scuttler: This guy comes with a jetpack and some cool ways to protect himself. LEGO Batman Movie The Riddler Riddle Racer: I had to include this villain at least once in the gift guide. The LEGO Batman Movie The Joker Balloon Escape: Will Joker really get away? LEGO Batman Movie Clayface Splat Attack: Build Clayface and get ready for the attack. Superhero BUBBLE Bath Bomb with Surprise Minifigure Inside: After the fizz has worn out from the bath bomb, you will find a superhero LEGO minifigure! Here are some of the most fantastic superhero books out there. Gather a few and pair them with a favorite Superhero Movie or two for one fantastic gift! There’s something for everyone in the family to wear that is superhero related. All the way from baby to adult! Justice League Baby Boys’ 5 Pack Superhero Onesies: The perfect gift for any baby. This set of Justice League Baby Girls’ Onesies is made especially for baby girls. Hooded Wolverine Sweatshirt: Perfect for the young fan. Go from a cozy sweatshirt to Wolverine by putting on the hood. DC Comics Batgirl T-Shirt With Cape And Mask: We all know that superhero t-shirts make great gifts, this one comes with a mask too! DC Super Hero Girls Not Your Average Girl Gray T-Shirt: When girls become superheroes, their anything but average. Wolverine Classic Character T-Shirt: Put the classic character on display with this cozy shirt. DC Comics Men’s Batman Basic Logo T-Shirt: Simple, and perfect. Marvel Universe Captain America Shield T-Shirt: Protection in the form of a t-shirt. DC Comics Periodic Table Of Superheroes Men’sT-Shirt: How creative! Superheroes as you’ve never seen them before… in the form of elements! The Flash and Green Lantern Socks: Sometimes, superhero strength comes from a pair of socks. Wolverine Socks: These colorful pair of socks are a great gift for the Wolverine fan. Green Lantern Hoodie: Sport your favorite superhero while staying warm. Marvel Team-Ups Men’s Team-Ups Group Shot T-Shirt: This shirt has all of your favorite superheroes. 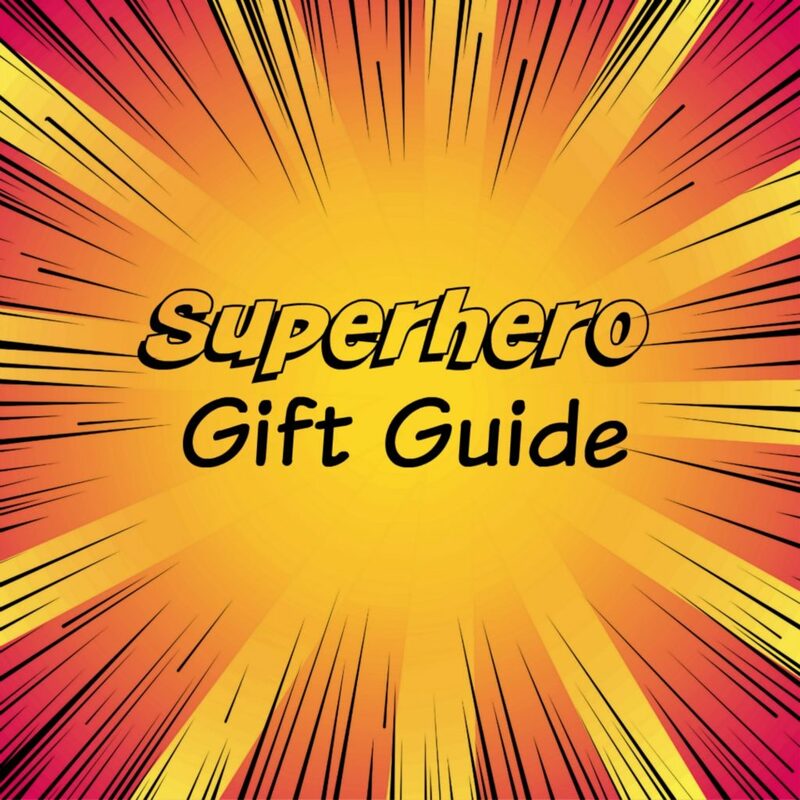 All of these superhero gift ideas include a variety of different items, from water bottles to Christmas tree ornaments. Gund DC Comics Stuffed Animals: These plush animals are dressed up as your favorite superhero. From Wonder Women to Robin, they have them all. DC Comics Green Lantern Comics Strip All Over Print Backpack: Another great way to show your love of superheroes. Marvel’s Ultimate Spider-Man Projectables LED Plug-In Night Light: Project Spiderman onto the ceiling with this fancy night light. Beard Balm Thor’s Hammer Scent: Superhero fans can now take care of their beards with the help of this beard balm that smells like Thor’s hammer. DC Comics Justice League Dog Tag Keychains: Keychains, with a purpose! Wolverine Dog Tag: Comes with a chain and an engraved dog tag. Daredevil Water Bottle: Superheroes need to drink water too. Now they can, in style. Superhero Slap Bracelets: Perfect for a party, or just for fun. Superhero Rubber Duckies: This set of rubber duckies are dressed up as their favorite superheroes and are ready to take a swim. DC Superhero Girls Band-Aids: Superheroes are always great for boo-boos. DC Superhero Ornaments: This set comes with 14 ornaments and includes every superhero from Wonder Women to the Flash. Hallmark Keepsake The LEGO Batman Minifigure Christmas Ornament: Everyone needs one of these mini-figures for their Christmas tree. Superhero home decor items make for some unique gifts. Take a look at what I found. 3D LED Spider-Man Lamp: This lamp produces one impressive 3D version superheroes. Batman Arkham City Logo Wall Clock: Love the cityscape on this clock. Batman Bat Signal Heat Changing Coffee Mug: Batman appears to save the City of Gotham when you fill the cup with a warm drink. Wonder Women Thermos: Keep your drinks hot with the help of Wonder Women. DC Super Hero Girls Wonder Women Lunch Bag: This lunch bag comes with its very own cape! Hanging Glass Hexagon Candle Lantern: Decorate your home with a green lantern or two. Green Lantern Retro Metal Tin Sign: This tin sign looks like an original poster. Marvel Spider-Man Ceramic Cookie Jar: Who stole the cookie from the cookie jar… spidey did! Marvel Avengers Waffle Maker: Breakfast just took on a whole new meaning. Spider-Man Apron: Spider-Man loves to cook! Didn’t you know? 3D Light FX Marvel Spider-Man LED Wall Light: This light takes on the appearance of Spiderman himself! Superhero Throw Pillow: Superhero…. with your four legged friend. Superhero Wall Print: This wall print comes in three pieces and displays three superheroes, Batman, Superman and Iron Man. Superhero Wall Canvas: A little reminder of what superheroes are made of. LEGO Batman Alarm Clock: Wake up with a little help from Batman. 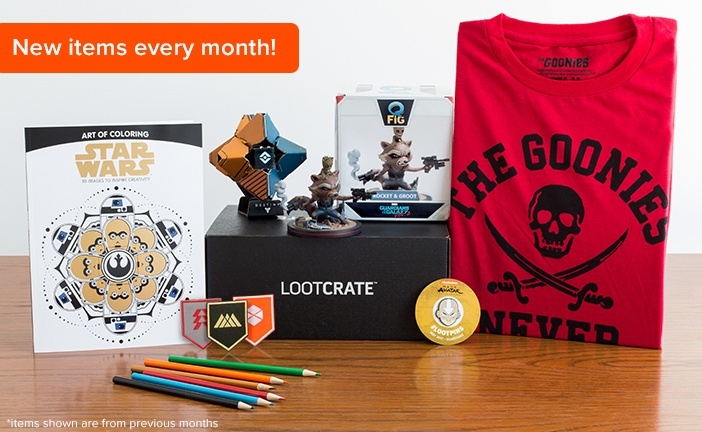 Loot Crate is a subscription box service that is shipped out once a month. There are several Loot Crates available to choose from including a Loot Crate for those mildly interested, one for pets, and a Loot Crate for the serious collector. 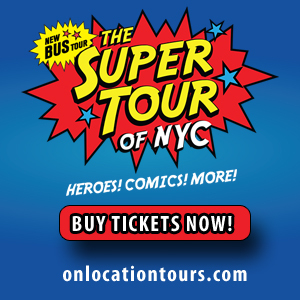 If you want to give a gift the Super Hero lover in your life will remember, gift them with an experience like The Super Tour of NYC from On Location Tours. This bus tour shares over 40 Super Hero TV and movie filming locations in New York City. Click here to read a review of the tour. Once you have picked out your favorite superhero gifts, don’t forget the card! This Pop-Up Spider-Man Greeting Card is just right for the occasion. And these Superhero Gift Bags make wrapping a snap. What are your favorite superhero gifts? You are welcome to share your top picks in the comments! Wow! What an incredible list! I know a few people that would love any of these items. The spider led lamp looks really cool. What a fun list! 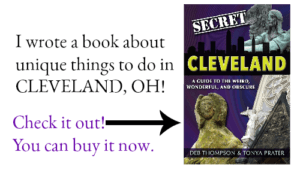 There is definitely something for everyone, and there are lots of great ideas. I’ll have to add some of these to my shopping list. Our son is superhero obsessed! He’s been Spiderman for 4 Halloweens in a row. My son loves all the Marvel super heroes. I am sure he would love to get the Play-Doh Smashdown Hulk for Christmas! What a great list full of amazing gift ideas. I love the Batman bear and know a little girl who would love that. What a great gift guide. I found so many great gift options. I have a few people on my list who love superheroes. So I think I have an idea what to get them now! Super fun list! I love the imagination of it all. I had a Wonder Woman doll when I was a kid. 😉 I’m especially partial to the PlayDoh set as well.